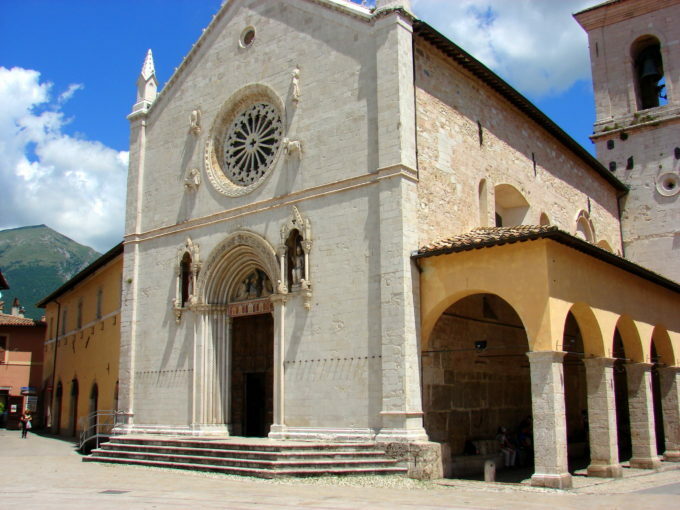 Italy has unfortunately experienced three large earthquakes in the past few months, the latest hitting the town of Norcia in Umbria quite hard. 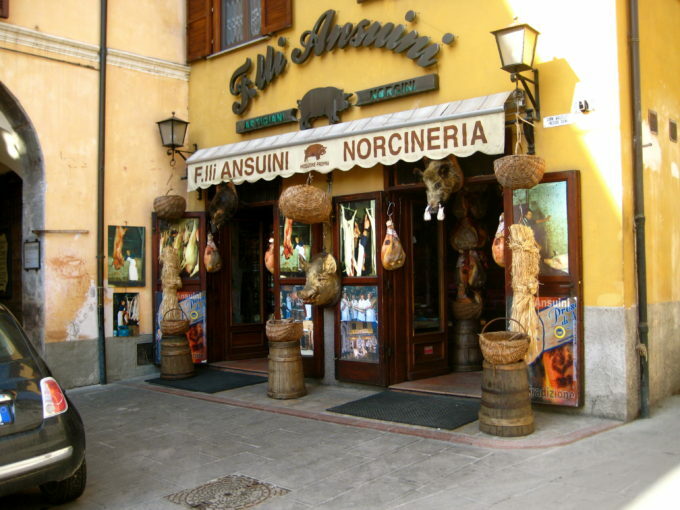 Norcia, like Amatrice (which was severely impacted by the first of the large quakes), is a gastronomic town famed for its butchers and their splendid pork products. Since the Middle Ages, the term “Norcino” has been synonymous with pork butchery and charcuterie (and even historically worked as surgeons). The talented “norcini” would travel around central Italy during the winter months to assist with the slaughter of pigs and the production of salumi. 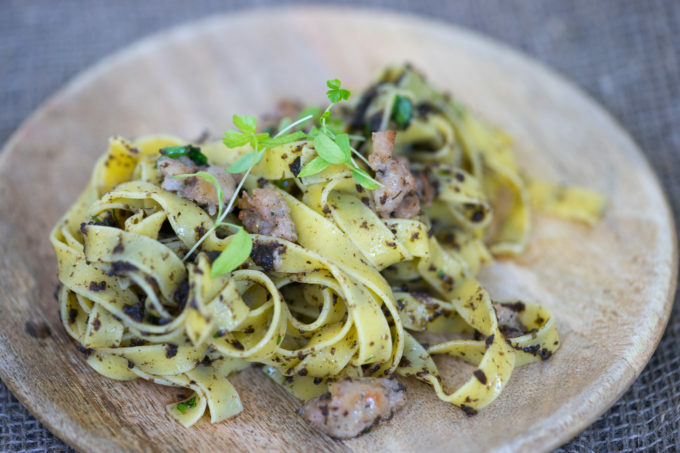 The term “norcina” in gastronomy can allude to any of the flavours Norcia is famous for: black truffles, prosciutto, cheese, lentils, legumes, mushrooms, farro and saffron. There are two pasta dishes which confusingly are both referred to by the same name, “alla norcina“. 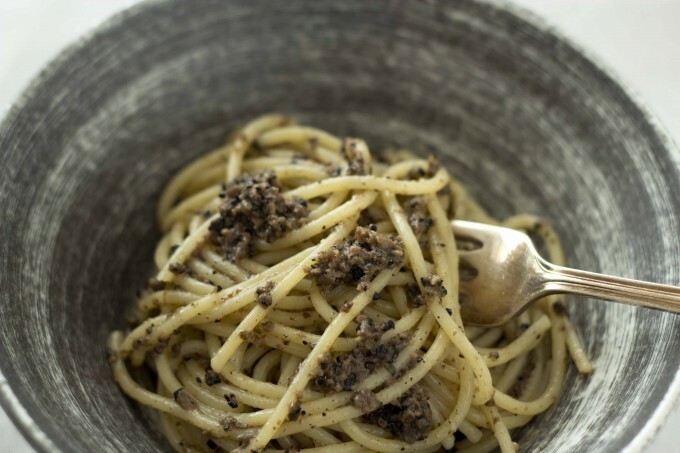 The first version of “alla norcina” is made with black truffles, anchovy and olive oil. Meanwhile in a frying pan, add the olive oil and the garlic. Heat over medium heat until the garlic is coloured. Discard the garlic. Add the sausage to the pan and break it up with a wooden spoon. Cook until it is coloured, about 3 minutes. Turn the heat off. Boil the pasta (fresh pasta will take 1 to 3 minutes and for dried pasta, check the package for recommended cooking times). Drain the pasta and add to the sausage. Stir in the parsley, black truffle and salt and pepper to taste. Serve immediately.